Down 28-21 to the Class 6A Carlsbad Cavemen at the half, the Bulldog basketball team knew it hadn’t given its best effort in the opening quarters. Not even close. “The biggest thing was I thought we weren’t doing a very good job of attacking the zone,” head coach Michael Mondragon said today. “I thought we got real complacent. The ‘Dogs committed a total of nine TOs in the first half, most unforced. Their shooting overall was a solid 50 percent on the half, but they simply weren’t taking enough shots, putting just 16 in the air. 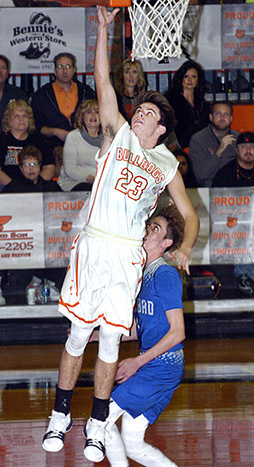 The overall result was a 57-45 come-from-behind win that bumps the ‘Dogs’ overall record to 12-5 on the year and earns them a split in this year’s Eddy County War, something of which the sizable crowd in attendance Tuesday was fully appreciative. Artesia wasted no time kicking off their comeback in the third quarter, as Tyler Greenwood opened with a three and Joe Willingham followed with a free throw and a shot in the paint. That brought the ‘Dogs back within one, 28-27, a margin Cody Smith maintained by answering a pair of Caveman buckets with hard drives to the hoop. Anthony Armendariz, Smith and Greenwood all went 1-2 from the free-throw line to tie the game at 34, and Taylor Null finished out the period 3-4 from the stripe to send Artesia into the fourth with its first lead since the opening seconds of the game, 37-35. 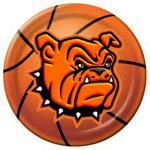 Buoyed by the fresh burst of momentum, the Bulldogs kept the pedal down. Smith delivered an and-one, Willingham a shot off the glass, and Chaney Hardt a drive to the hole for two to quickly make it 44-35, and Willingham, Hardt and Kale Mauritsen surrounded a Smith trey with a free throw each to put Artesia up by 11 with 2:15 to go, 50-41. The ‘Dogs continued to convert on enough if not all of their freebies as Carlsbad began feeling the pressure to foul to maintain a double-digit lead into the final minute. There, Carlsbad’s Patrick Espinoza would hit from beyond the arc with 22 seconds left, but the shot could only bring the Cavemen within 10, 55-45, and Hardt rounded out the final from the stripe. “I’m just proud of the guys, the way they came out after the half, the way they responded,” Mondragon said. “It was a great team win. With turnovers hampering their offensive execution in the first quarter Tuesday, the ‘Dogs got the bulk of their eight points from breakaway layups, which came courtesy of Willingham, Greenwood and Smith. Clay Houghtaling closed the period with a bucket, but Artesia trailed 15-8 going into the second. With Davion Young dominating the paint for the Cavemen in the second, the Bulldogs didn’t log a field goal until the 4:48 mark, but Willingham used it to kick off his own tear in the lane, posting seven points to help Artesia stay within that margin at the break, 28-21. Willingham and Smith tied for top scoring honors for Artesia with 15, followed by Greenwood with 10, and Young led all scorers with 19 for the Cavemen. The ‘Dogs shot 55 percent from the field on the evening to Carlsbad’s 40. The road warrior Bulldogs will now prepare to hit the trail once again this weekend for a 6:30 p.m. game Friday in Alamogordo, followed by a 2:30 p.m. bout Saturday in Santa Teresa. “It’s another big weekend for us and our last two chances to get better and get ready for district,” Mondragon said. “We’ll have two great days of practice, work on fixing those little things, and then hopefully go pick up two wins on the road.